Queen Henrietta Maria was the consort of King Charles I of Great Britain. She was the daughter of King Henri IV of France and Marie de Medici and so was the sister of King Louis XIII. When she married Charles I in 1625 many in England were unhappy at the choice of a French Catholic princess but Charles was more worried about his bride being taller than him (the King was extremely short). However, he need not have been so as Henrietta Maria was an extremely petite woman, almost tiny in fact, but very beautiful like a very delicate little bird. However, her small size was out of proportion to her very strong will and unbreakable principles. She insisted on keeping her Catholic confessor and would not even attend her own husband's coronation because she refused to attend any Protestant services. She was an extremely devout Catholic to say the least. The marriage had a somewhat rough start but Charles found his Queen to be a tower of strength for him after the death of the Duke of Buckingham (whom the Queen disliked) and the two had probably the most happy marriage of any couple of the Stuart dynasty. Charles and Henrietta Maria were devoted to each other, faithful to each other and respected each other and saw the succession secured with seven children. She detested the Puritanical streak of the Protestant elites in Parliament and worked to secure the support of the Catholic powers on the continent for the King, not only from France but Spain and the Holy See as well. Even with civil war engulfing Britain Queen Henrietta Maria showed herself more than up to the challenge. After raising money for the royalist cause in Europe she landed in northern England and based herself at York surrounded by her own troops before joining the King at Oxford. After the regicide of Charles I she went into exile in France where she never relented in pushing for the restoration of the British monarchy and urging her children to convert to Catholicism. When the monarchy was restored she lived in England again for a while but finally returned to her native France where she founded a convent and spent her final years. She adamantly believed that her husband Charles I had become a Catholic before his death though this is hotly debated and usually dismissed. What is not disputed is that her sons King Charles II and King James II both converted to Catholicism and maintained the style of monarchism that their mother (and father for that matter) had approved of. 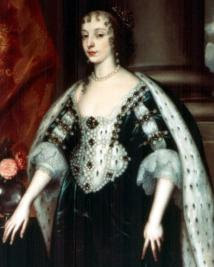 In the United States Queen Henrietta Maria is commemorated by the state of Maryland which was named in her honor when established as a colony for English Catholics. The Queen died in 1669.